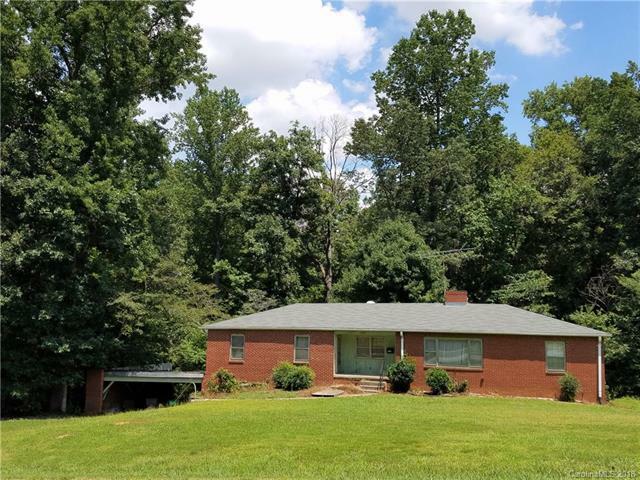 Full brick custom well built in 1954 & approx.1970 addition being sold w/adjacent lot which runs all the way to Dogwood Circle; good place for 2nd drive. House lot runs across entertaining creek. Lots total 1.58 acres. Tax info is incorrect on some details. New roof 2011. Mountain-like atmosphere in back with mature trees, privacy;huge master suite w/heated tile floor in bathroom, dual sink vanity, sep. heat, walk-in closet; huge bonus/den w/built-ins; wood floors in 3 bedrooms, hall & living rm. Full basement:partially finished/finished, has 3rd full BT, office space, storage, workshop or whatever you can dream up. Grand home needs some TLC; some mold detected in basement unfinished area. Being sold AS IS. Easy route to airport, near I-485 & I-85, easy commute to uptown, Whitewater Center, quick to Outlet Marketplace, and more. Grow a really big garden, play football!